Did you know that Damian Lewis received the Freedom of the City of London honour at London’s Guildhall in recognition of his achievements as an actor in March 2013? Freedom of the City of London is one of the oldest surviving traditions still in existence today. It is believed that the first Freedom was granted in 1237. According to Wikipedia, being a “free man” in old times came with certain privileges, varying from the right to drive sheep and cattle over London Bridge to carrying a naked sword in public. Just for your information, Damian, in case you fancy a walk with your flock over the London Bridge — ask Stephen Fry who has liberally used his privileges! Here is Damian talking very graciously about the Freedom of the City of London honor. 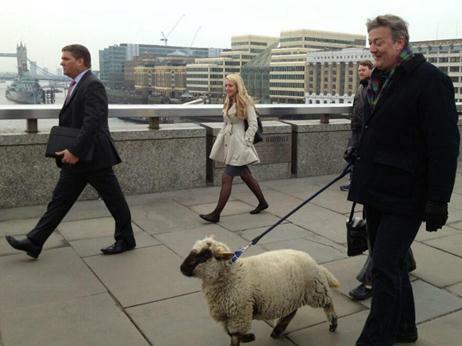 Haha, well, he deserves the right to drive his sheep over the London Bridge, doesn’t he? But can he walk his Goat?